The below post was originally Posted on March 2, 2012 in reply to Laura Stuart a British citizen who embrased Sunni Islam and Joined Sectarian “Muslim” Brotherhood. Cosequently, Laura was a strong supportet of Hamas, Laura Stuart is one Mavi Marmara Survivors. There are some Palestinians amongst my friends who say that Assad has helped them, this is true. But success will never come for the Muslims by expecting a solution from a deviant sect like the Shia. Success for the Palestinians will only come from Allah s.w.t. and the Palestinians of all people should know that there is no solution from any other power. Allah is asking “you who have believed,” to prepare for THEM and others besides them(Your real enemies, not the so-called “deviant sects”, look around you and you will see both THEM and OTHERS BESISES THEM) what FORCE you can…. to “frighten“ them and others beside them. According to syrian resercher Professor Mohamad Shahrour IT refers not to Peace in vesres 61, but to FORCE in Verses 60. As far as I see, only Syria and Iran are doing that, and because they did there enemies, the Zionized western countries, are in a mess, and are seeking the help of those “besides them” I mean Islamists, Arab league, the UN, to divide us. SO, get out of “them” and our of “those besides them”. I am sure is if you zoom out of your “Islamist VEIL” and storm your brain while reading your Quran, by your eyes and your brain, not by the eyes of puppets such as Sheik Arifi, I am sure you would understand the stupidity of Islamist idiots, and realize that the so-called deviant sects, and their Sunni Hamas (I am not sure if they will continue), are the only Muslims, following the the Quran of both Shia and Sunna. Filed under: Islam, Islamists, Palestine, Quran, War on Syria, Zionized western countries | Tagged: Laura Stuart |	Comments Off on "Success will never come from deviant"
People are asking Laura Stuart why she do not comment on the situation in Syria, unfortunatly she replied with a vidoe as her reply with just a few comments. Luara should asked what about Palestine? Because if the situation in Syria is dividing us all, if we are really united on Palestine, the central cause for Arabs and Muslims, Palestine should make us understand what’s goining on in Syria, and who is responsible for the killing in Syria, and should unite us all about the Situation in Syria. I wonder if Laura knows that Syria was the cradle and the safe haven of resistance since early sixties. If she knows, I wonder if she knows that deep in the Syrian Mind, Palestine is an Occupied Syrian Land, that the struggle in the so-called middle east is between Greater Syria and Greater Israel. Why the Syrian Shaikh Ezzideen Al-Qassan martyred leading 1936 revolution is a Palestinian Hero and symbole of resistance, even for Palestinian secular factions? Why Bashar “has done more to help the resistance against Israel than most of the corrupt leaders of Muslim Arab lands.”? Why Syria is the living Hart of Arab nationalism as Hasser called it? And why Syria is wanted now, like it was wanted in 1950’s by the Brothers of America ? Zoom out of your Veal, and your Islamists and their enemies, the liberals who missed the direction, to serve the Zionist new plan to divide the divided, they checked the KING, and embalmed his regime, to secure the interests of Zionized western countries and their Zionists puppet. Syrians did the contrary, the checked the corruptions and oppression and Kept the King to lead the Syrian Resistance Spring. The real citizens of Syria rose up peacefully against oppression, but without missing the direction, and achieved what others failed to do. When I read the Fatwa, I immediately remembered Laura, and her brother, Khalid Hamayreh, and their propaganda war on Syria, Iran and what Hamayreh called ‘Shiits of Iblis”. Hamayerh described the Shae temporary marriage a kind of prostitution. The fatwa states that Syria ‘freedom’ fighters against the regime, unmarried or married but can not meet their wives, may mary girls , 14 years and above, or widows and divorced women for short periods not exceeding few hours to give the opportunity to another fighter to do the same with the same girl/woman. The aim of the fatwa is to enable the fighters to get their “legitimate right” and thus raise their morale of combat. Moreover, the Syria’s Jihadis girls/women who follow the fatwa are entitled to go to Paradise. Back to the Shea temporary marrage, the marrage is allowed in certain case, provided, the girl, woman, can remarry only after making sure that she is not pregnant, if pregnant her son/daughter is entitled to get his/her share in the father‘s legacy. I will leave it to the readers to decide which one is prostitution? 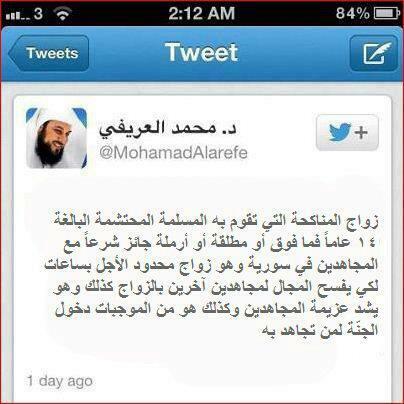 Good for Syria’s Jihadis morale, says Dr. Alarefe! أصدر رجال دين يدعمون الحركات الاسلامية المقاتلة في سوريا فتوى تجيز ما سمي بجهاد المناكحة في سوريا. وتنص هذه الفتوى على إجازة أن يقوم المقاتلون ضد النظام من غير المتزوجين أو من المتزوجين الذين لا يمكنهم ملاقاة زوجاتهم بإبرام عقود نكاح شرعية مع بنات أو مطلقات لمدد قصيرة لا تتجاوز الساعة أحيانا يتم بعدها الطلاق وذلك لإعطاء الفرصة الى مقاتل اخر بالمناكحة. وذكر رجال الدين الذين أفتوا بهذه الفتوى ان الهدف منها هو تمكين المقاتلين من حقهم الشرعي بالمعاشرة وهو ما يزيد من عزائمهم ويرفع من معنوياتهم القتالية. وقد شرع بنشر هذه الفتوى على نطاق محلي في المناطق التي سيطر عليها المقاتلون الاسلاميون من خلال حث الفتيات على هذا الجهاد واعتباره أفضل وسيلة لجهاد المرأة ضد النظام . ومن بين الشروط المطلوب توافرها في الفتيات المجاهدات بالنكاح هو ان تتم ال 14 من العمر أو مطلقة ترتدي النقاب أو الزي الشرعي. وقد اعتبروا ان هذا الجهاد هو جهاد في سبيل الله وفق الصيغ الشرعية يخول للقائمة به دخول الجنة . I posted the article of brother Stuart Littlewood, and read the comments on it on deLiration. disagree with Stu, and this is not the first time. On 05. Sep, 2010, Stuart called: Hamas, don’t blow this chance. Hamas would also do well to frame their case in a manner that allows others, outside the Holy Land, to sympathize and feel persuaded that it’s time they were welcomed into the mainstream. I have the courage to admit that I was wrong about Hamas leadership. Two years later, Hamas leadership did what Stu and others asked, but not for fun. I am sad to say that Hamas Leadership failed to learn from the lesson of 1973 war, Camp David and Oslo, and Mishaal would face the fate of Sadat or Arafat. Zooming out of Gaza, and Palestine, I would claim that despite Gaza’s courage under fire Hamas puts a brake on the Palestinian ambition, and may lead under current Hamas leadership and its brothers in the Arab Spring to A New OSLO wearing a beard, or call it, an Islamist’s Camp David. The so-called Arab Spring in Egypt delivered nothing but a new Mubarak wearing a beard, I would say a Mubarak cubed ( Raised to Power 3). Like Mubarak he is a dictator, but, being backed by Egyptian and International brotherhood he is more dangerious. Unlike Mubarak he is a sectarian involved to his ears in the American aganda for new middle east. In other words: IF THEY INCLINE TO PEACE, THEN INCLINE TO FORCE, to keep the ememy frightened and prevent WAR. May be Stu would say: Well thats exactly what Hamas did. I would say, true, Hamas and other factions did it, thanks to Palestian freedom fighters and to IRAN, SYRIA, and Hezbollah, but SIR, Hamas leadership is looking for a long very long truce, and its Qatari God father, who tamed and brought Mishaal to the house of obedience, would turn Gaza into a new Dubia, “a lot of prosperity weaken the resistance”. and like what America and Europe did in WB, turn thousands of freedom fighters into an army waiting their salaries. Bribing Hamas achieves two goals of the donor countries, first ensure turning Hamas into an independent authority in Gaza eager to serve Israel’s security, and the second get it away from the axis of Hezbollah and Iran, who supported supported the ungrateful Hamas financially and militarily. Palestinians, who turned the page of PLO, are able to turn the page of tired Hamas leadeship, and the Majority of Gazans are refugees waiting to return to their villages and towns occupied by Israel. Ibrahim al-Amin: Gaza: What Strategy for the Resistance? Updated: “Slip of Clinton’s tongue”: “Hamas” assassinated the chief of Syrian missile program!? by Laura Stuart The Respect Party has scored another victory in Bradford winning 5 seats in Bradford Council. The leader of Bradford Council Labour Candidate Ian Greenwood has also lost his seat. Will the 3 main political parties in the U.K. get the message? The messages are many but the main points are that the people of Bradford are against the endless wars which have cross party support in the U.K. and also that we can’t see any difference to our lives which ever of the main parties is in power. Muslims were traditionally Labour voters but the Labour party cannot count on that any more. Muslims in Bradford have woken up to the fact that they can actually make a difference by getting out and voting, something which is controversial in itself as it is interpreted by some as wrong to be a participant in any form of goverment which is not shariah. “More than 60 years of protests and of petitions have not changed anything on the ground for the Palestinian people.” She claimed “As a Muslim I convinced that the situation in the Middle East will change only when the Muslims and particularly the Arabs decide they want to take action. When the Arabs and Muslims reach this point then as we have seen with the Arab Spring even the most vile and oppressive leaders and regimes can be toppled.” she added. Laura is talking about Muslims and particularly Arabs, most likely she meant Arab Muslims, and unless she changed her mind she is taking about Arab Muslim brother, because, her Shaikh told her “Success will never come from deviant sect like the Shia” (click the link and read my coment on that), In other words success will never come from Alawis in Syria, Shia in Iran and Lebanon, the Axis if resistance. “When the Arabs and Muslims reach this point then as we have seen with the Arab Spring even the most vile and oppressive leaders and regimes can be toppled.” she claimed. Most likely, Laura is talking about Egypt and Tunis, where her brothers hijacked the half-revolution, and reached a conclusion: to govern we should respect the international agreements (Camp david), and Tunis constitution, where Israel is not an enemy. She meant also her Nato brothers in Libya, caught yesterday off Lebanese shores Smuggling Weapons to Syria, the Muslim land occupied by deviant sect. Finally I agree with Laura, Islam is is the only solution, but in a country like Iran, in a country, like Lebanon and Syria, even in Egypt, Islam (I mean Colorblind islamist’s ISLAM) is the problem. Resistance, starting with protest outside the Israeli embassy or Downing Street, all forms of popular resistance ending with armed resistance is the only solution. Zoom out of your dark veil. Its not black or white. We should be standing up as Muslims (HUMANS), and believe that we can make a difference if we organise and unite. But I have come to the conclusion that such actions as protesting outside the Israeli embassy or Downing Street have zero value, of course it’s always nice to see my friends and fellow activists but I keep asking myself – what does this really achieve? I go home after such protest happy to have seen my friends but thinking so what really happened there? We waved a few banners and shouted a few chants but in reality nothing – absolutely nothing changed. More than 60 years of protests and of petitions have not changed anything on the ground for the Palestinian people. As a Muslim I convinced that the situation in the Middle East will change only when the Muslims and particularly the Arabs decide they want to take action. When the Arabs and Muslims reach this point then as we have seen with the Arab Spring even the most vile and oppressive leaders and regimes can be toppled.